Although L'Agulhas, as I wrote about in my last post is small and quiet, there are some unique and interesting sites to see there. Below are some of my favorite pictures taken last week when we visited. 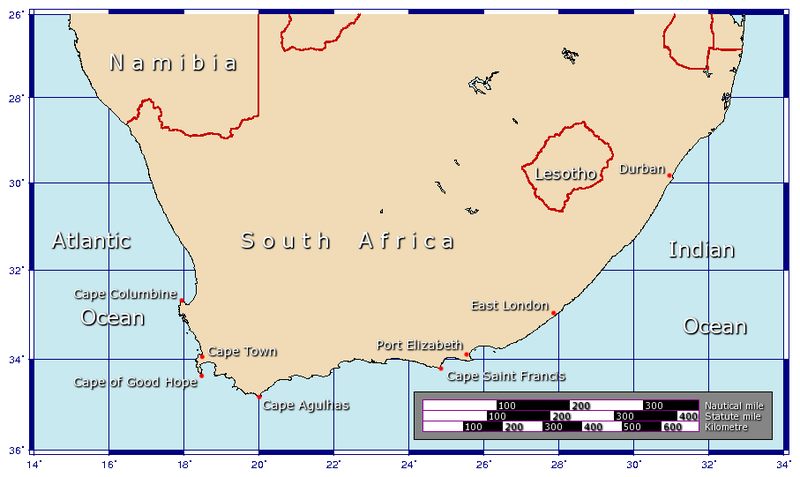 First, a map to show you the exact location of Cape Agulhas. If you are wondering what is the difference between Cape Agulhas and L'Agulhas, the Cape is the point where the two oceans (Indian and Atlantic) meet and L'Agulhas is the name of the town. The coastline is rocky and the seas are rough! A close up view of the rocks with this orange tint. I'm not sure what it is. I read the waves can get as high as 30 meters. That's 100 feet to us Americans. To get out to the point where the Indian meets the Atlantic we walked along this boardwalk. A picture of the official spot is below. Any cape worth its salt has a lighthouse. We climbed up the lighthouse and I got this unique shot. We also visited the next town over called Struisbaai and found these colorful boats offshore.